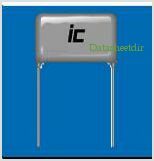 +105°C Metallized Polypropylene Epoxy Dipped Radial Lead Capacitors 103MPR400K By Illinois Capacitor, Inc. This is one package pinout of 103MPR400K,If you need more pinouts please download 103MPR400K's pdf datasheet. 103MPR400K circuits will be updated soon..., now you can download the pdf datasheet to check the circuits!